This article outlines the clinical presentation, neuroradiological approach, and the application of helpful ancillary investigations in the diagnosis of a range of cranial nerve syndromes. These syndromes are characterised by combinations of cranial nerve lesions that occur because of the involvement of contiguous nerves that direct investigation to a specific site. The syndromes highlight some important basic anatomy—in particular, knowledge of the contents of the cranial nerve exit/entry foramina (table 1) as well as the sites at which cranial nerves are clustered (table 2). The rate of presentation, with or without more widespread neurological or systemic involvement, hints at the particular pathological process at play. Advances in neuroimaging mean that the clinician and neuroradiologist have a range of available modalities to choose from. Discussion and appropriate selection of these is essential to accurate diagnosis and correct management. Magnetic resonance (MR) imaging is the modality of choice to depict many of the lesions involved in producing these syndromes based on their water content and molecular environment. Data can be acquired in multiple planes with differing contrast and is especially useful for showing soft tissue anatomy and pathology. There is now also widespread availability of spiral (helical) volume computed tomography (CT) where high definition planes or surfaces can be reconstructed to produce detailed depiction of bone, contrast filled vessels, and enhancing soft tissues based on their differences in electron density. Bone hardening and streak artefacts are reduced by this technique. Intravenous extracellular contrast agents (gadolinium based for MR imaging and iodine based for CT) are essential components of the examination. Catheter digital subtraction angiography (DSA) is still a key examination for showing vessels and as a route for therapeutic embolisation but has been superseded in many situations by less invasive CT angiography (CTA) or MR angiography (MRA). Plain radiographs are rarely used and are only justified in the assessment of remodelling of the skull, diffuse density changes, or gross fractures. This fissure lies at the back of the orbit between the lesser and great wing of the sphenoid. It curves downwards and medially widening at the orbital apex containing the superior ophthalmic vein, ophthalmic division of the trigeminal nerve and branches (lacrimal, frontal, supraorbital, supratrochlear and nasocillary), and the nerves to the extra ocular muscles (table 2). The syndrome is characterised by retro-orbital paralysis of extraocular muscles, impairment of the branches of the 1st division of the trigeminal nerve and frequently extension to involve the optic nerve. Examination shows ophthalmoplegia, ptosis, decreased corneal sensation, and occasionally visual loss caused by mechanical optic nerve compression. The presence of proptosis, with swelling of eyelids and chemosis (swelling of ocular surface membranes), indicates significant mass extension within the orbit. Potential causes include traumatic craniomaxillofacial injuries, tumours of the orbit (lymphoma or rhabdomyosarcoma) and adjacent structures, infection, inflammatory disorders, and vasculitic and ischaemic diseases. Orbital inflammation may be isolated (non-specific orbital inflammation), or associated with systemic inflammation such as Wegener’s granulomatosis, polyarteritis nodosa, sarcoidosis, or, rarely, temporal arteritis. Fungal infection of the orbit is an important though rare cause of an orbital apex syndrome and is usually secondary to sinus involvement. 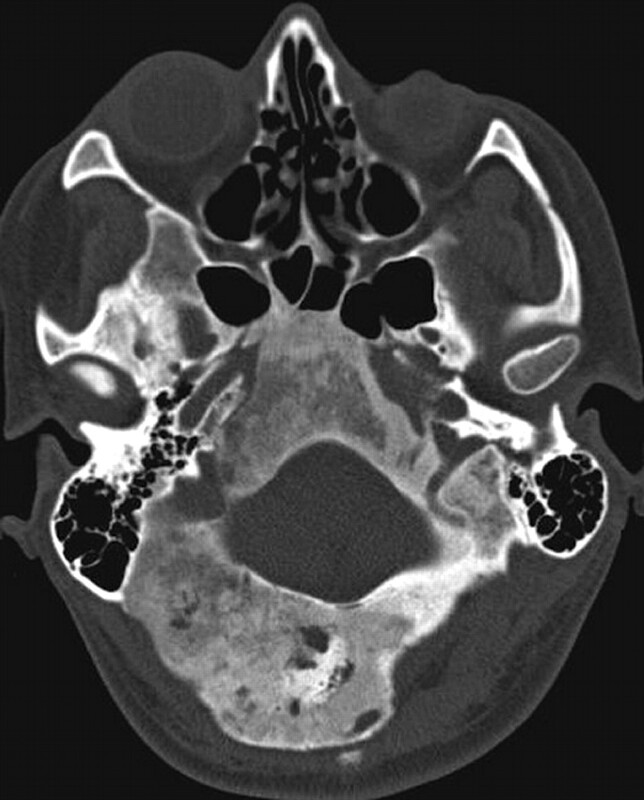 The cavernous sinus extends posteriorly from the superior orbital fissure to the dorsum sella. The fissure and the anterior cavernous sinus contain the same structures, and determining which is involved in the absence of orbital mass signs is dependent on imaging. exhaustive investigation excluding other local pathology or systemic process. THS accounts for < 5% of cases of painful ophthalmoplegia, and affects both sexes equally and all ages, with a peak in the fifth decade. Pain is characteristically peri- or retro-orbital, severe, and lancinating in quality. Aetiology is unknown. Spontaneous remission occurs in one third though residual signs may persist indefinitely. The universally positive response to steroids is regarded by many as a diagnostic criterion, but other alternative processes, in particular lymphomas, also respond initially. There are no evidence based guidelines for particular steroid regimens. The fractures associated with craniomaxillofacial injuries are best demonstrated by non-contrast helical CT with high definition multiplanar reconstruction. A clear overview of the lesion complex can be shown with three dimensional surface reconstruction, giving the surgeon a better view of the relations of the fractures and their displacements (fig 1). Low dose techniques with bone filters can minimise the patient’s exposure to ionising radiation. Either CT with soft tissue windows or less commonly an MR examination is used to depict the associated soft tissue damage to the orbital contents, and adjacent intracranial temporal lobes, frontal lobes, and cavernous sinuses to show lacerations, haematomas, and contusions. A 25 year old involved in a road traffic accident. 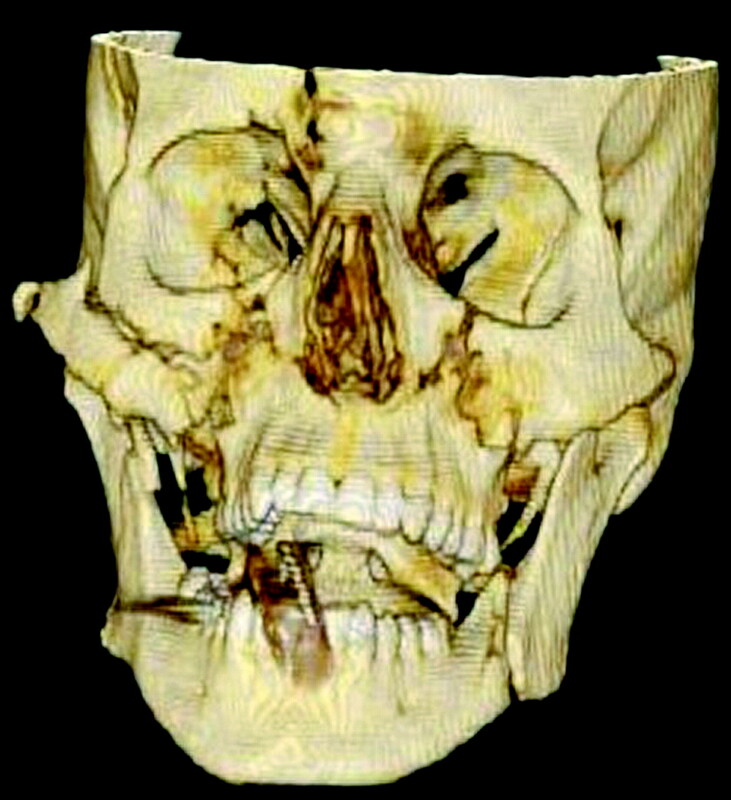 Three dimensional surface rendered computed tomography (CT) of the face and orbits showing a complex Le Fort III fracture involving the right superior ophthalmic fissure and frontal bone. Soft tissue masses and inflammation involving the orbit can all be shown by helical non-contrast CT in the same plane as the optic nerve. Abnormalities are shown contrasted against the low attenuation orbital fat. Coronal and sagittal reconstructions can be used to assess further the full extent of the lesion. Occasionally intravenous contrast will give further information with vascular masses such as haemangiomas, lymphomas or arteriovenous malformations (AVMs) showing enhancement (fig 2). Lymphoma may be so infiltrative that it cannot be differentiated from the inflammation of orbital pseudotumour. MR examination with T2 weighted axial sections and fat saturated T1 weighted sections are ideal to show the soft tissue components of these lesions unobscured by any artefacts produced by dense bone on CT. The axial and coronal planes are the most useful. Short tau inversion recovery (STIR) sequences can be used to null the fat signal but still retain T2 weighting and will show most lesions as hyperintense. As with CT, intravenous contrast with T1 weighted sections occasionally helps with the differential diagnosis. Mainly intraconal enhancing orbital mass on axial CT displacing the optic nerve and extending into the superior ophthalmic fissure. The differential lies between haemangioma, lymphoma, and neuroma. Biopsy showed a lymphoma. The non-specific but sometimes widespread inflammation of THS can result in narrowing of the cavernous carotid artery and irregularity or thrombosis of the superior ophthalmic vein and thrombosis of the cavernous sinus. These were originally shown on DSA but now non-invasive CTA or MRA can be used. 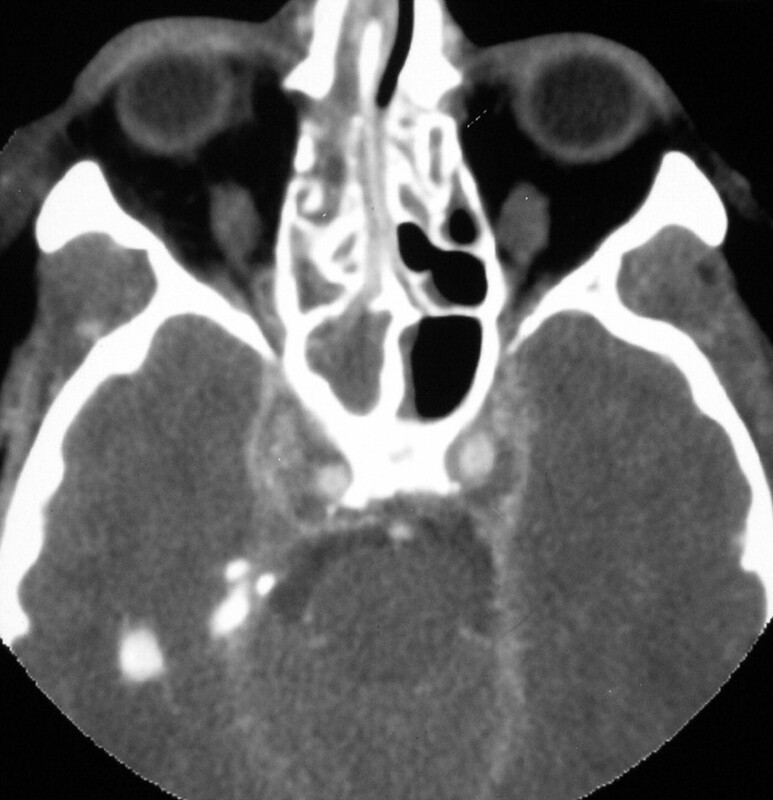 MR and CT examinations with a bolus of contrast may also show enhancing mass lesions extending from the cavernous sinus into the orbital apex or onto the floor of the middle fossa while displaying the cavernous carotid artery. MR may show abnormal hypointense signal, similar to muscle on T1 weighted sections running into the orbit (so called “dirty fat” signal). In the absence of a history of trauma or disease specific neuroradiology, systemic disease requires exclusion. Laboratory workup could include: full blood count (FBC), erythrocyte sedimentation rate (ESR), C reactive protein, electrolytes and blood glucose, antinuclear antibody (ANA), extractable nuclear antibodies (ENA), antineutrophilic antibody (ANCA), serum protein electrophoresis, borrelia serology, and serum angiotensin converting enzyme (ACE). Cerebrospinal fluid (CSF) examination (infections, granulomatous disease, and malignancy) can be helpful. Biopsy may be necessary but is technically challenging and usually only considered after a trial of treatment with steroids with no initial response or following early relapse. These paired venous structures lie either side of the sella turcica and lateral to the pituitary. Each receives the superior and inferior orbital veins before then draining into the superior and inferior petrosal sinuses. The internal carotid artery lies within the sinus in proximity to the pituitary gland while the oculomotor, trochlear, abducens, and trigeminal (1st and 2nd division) cranial nerves pass laterally on its wall as do postganglionic sympathetic fibres on route to the orbit. The maxillary (2nd) division of the trigeminal nerve lies in the lower posterior part of the cavernous sinus before exiting through the foramen rotundum. The ophthalmic (1st) division descends as it traverses the whole length of the lateral wall of the sinus to exit though the superior orbital fissure. The symptoms and signs of cavernous sinus disease are ophthalmoplegia, orbital congestion and proptosis, trigeminal sensory loss, and sympathetic disturbance. Sympathetic fibres join the abducens nerve for a short distance and thus a Horner’s syndrome in conjunction with 6th nerve palsy is of precise localising value. Cavernous sinus pathology accounts for 5% of all cases of ophthalmoplegia. Causes can be divided into vascular (aneurysms, fistulas, and thrombosis), tumours, and miscellaneous inflammatory disorders (including THS). Aneurysms tend to enlarge, becoming “giant” and compressing adjacent structures resulting in an indolent painful ophthalmoplegia. Giant intracranial aneurysms are defined as those > 2.5 cm in diameter. They represent 5–8% of all intracranial aneurysms with 60% arising from the internal carotid artery. Patients tend to be elderly, usually with minor symptoms though endovascular occlusion may be indicated in a selected few with troublesome complaints. Cavernous aneurysms do not carry a significant risk of subarachnoid haemorrhage; if they rupture they do so locally, resulting in the formation of a carotid cavernous fistula. Carotid cavernous fistulas result from the unique relations of the cavernous sinus, this being the only anatomical site at which an artery passes directly through a venous channel. Fistulas are divided into direct where the cavernous segment of the carotid artery and the cavernous sinus are in continuity, and indirect where shunt(s) are established though meningeal branches from the carotid system. Direct fistulas develop rapidly after closed head injury or aneurysmal rupture and are characterised by the classic triad of chemosis, pulsatile exophthalmos, and a bruit over the eye. Indirect fistulas are insidious with arterialisation of the conjunctiva often without an audible bruit. While dural or indirect fistulas often resolve spontaneously, direct fistulas do not and often usually require complex interventional management. 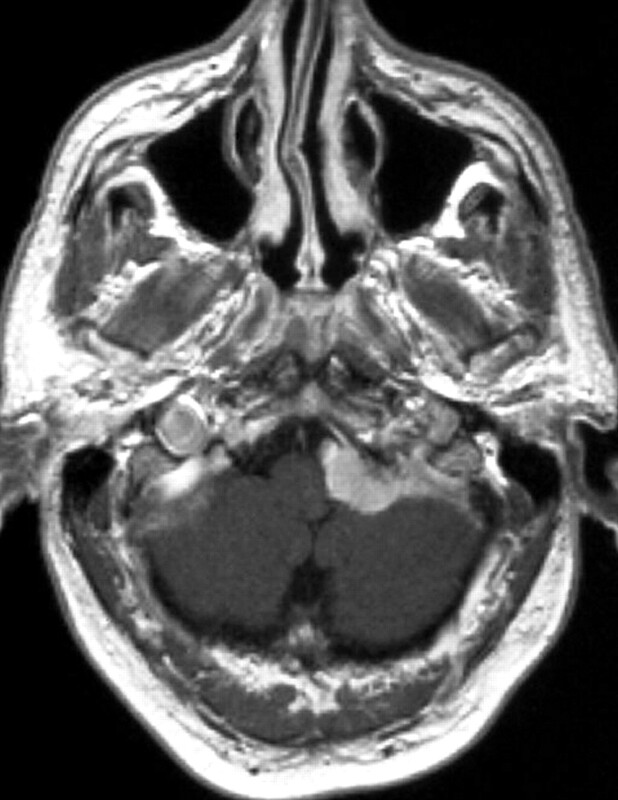 Cavernous sinus tumours are the most common cause of the cavernous sinus syndrome. These may be metastatic (from lung, breast, prostate, etc), result from local spread (nasopharyngeal, pituitary, craniopharyngioma), or be primary tumours (meningioma, neurofibroma). Pituitary tumours can invade one or both cavernous sinuses adjacent to the pituitary gland. Here ophthalmoplegia is associated with more longstanding endocrine symptoms of acromegaly, galactorrhoea, or hypopituritism. Unilateral or bitemporal visual field defects often coexist. 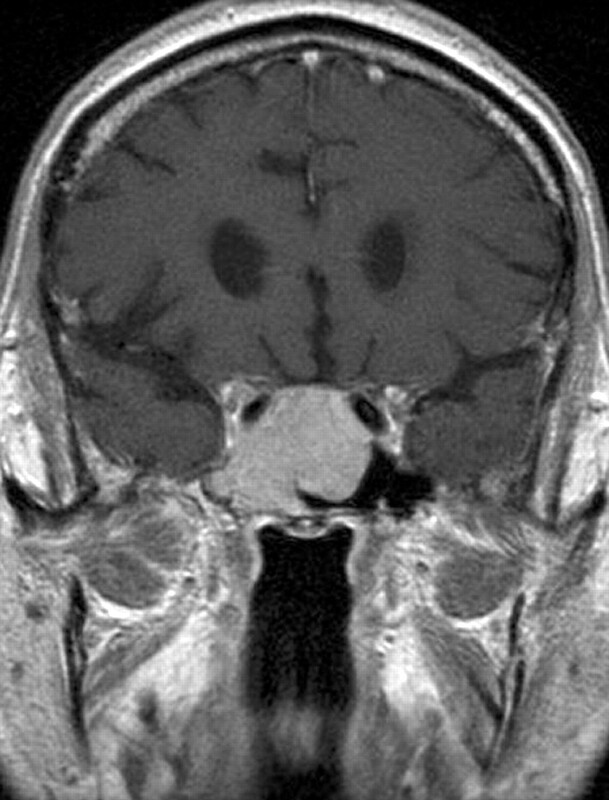 Meningiomas involving the cavernous sinus may start in the sinus or grow into it as an extension from a larger tumour involving the medial sphenoid wing, orbit, clivus, or petrous bones. Natural history in some patients may be that of minimal or no growth for long periods of time; given the risk of significant cranial nerve morbidity with surgical treatment, management decisions are difficult. 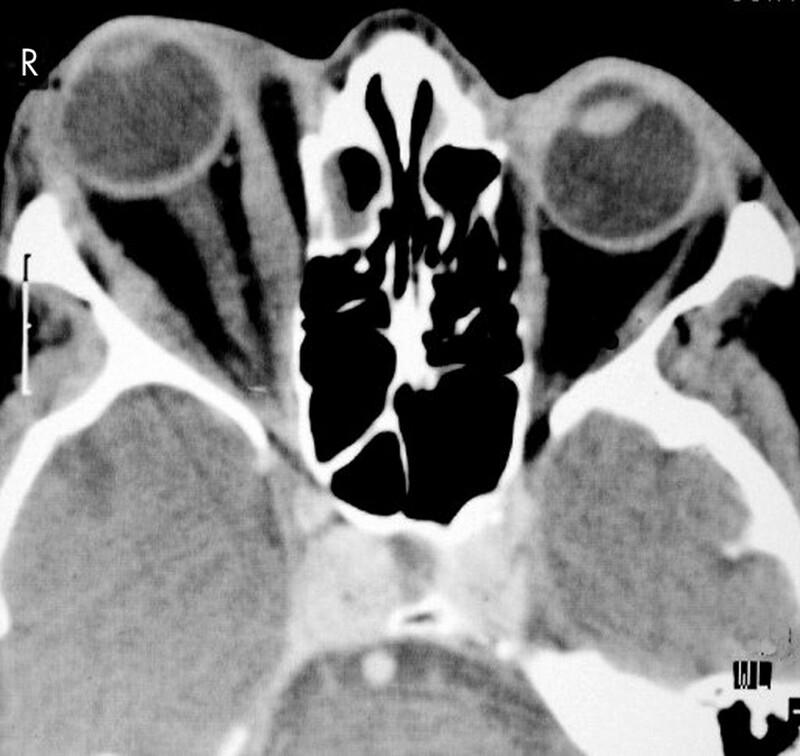 Cavernous sinus thrombosis is usually secondary to paranasal sinus infection, orbital cellulites, or midface infection (furuncle). Fever and malaise precede neurological findings. The initial localising features are unilateral chemosis, periorbital oedema, and eyelid swelling. As retrobulbar pressure increases, ophthalmoplegia and exophthalmus ensue. Finally pupils become sluggish, extraocular palsies develop, acuity diminishes, and contralateral signs emerge. Most cases occur in previously healthy persons, though diabetes predisposes. Staphylococcus aureus is the most frequent causal organism though pneuomococci and fungi can be encountered. Management comprises appropriate antibiotic treatment supplemented by anticoagulation to prevent septic emboli, steroids to reduce oedema, and surgery to drain the primary infective source. Diagnostic delay results in significant mortality and permanent sequelae. The cavernous sinus syndrome may result from any inflammatory granulomatous process such as sarcoidosis or midline granuloma. Herpes zoster with typical zoster blisters, pain, and ophthalmoplegia may mimic. THS has been already discussed. In this region MR, CT, and DSA all have a role. When mass lesions are suspected MR is usually the examination of first choice, while vascular conditions such as thrombosis, aneurysms, or fistulae are best shown with CTA initially and then, if required, DSA can be used to delineate the detailed morphology and flow patterns. As aneurysms present with mass effect they are often shown as “flow voids” or a hypointense signal on routine T2 weighted MR sections. Positive delineation can be obtained with CTA (fig 3), MRA, or DSA. The secondary consequences of carotid cavernous fistulae are shown on routine post-contrast axial CT and on MR with T1 weighted and T2 weighted axial or coronal sections. CT angiography (CTA) showing a carotid siphon aneurysm in the cavernous sinus. It bulges laterally into the middle fossa. The parent vessel can be seen curving medial to the aneurysm. To show the fistula itself requires DSA with early venous filling from the intracavernous carotid or its meningeal branches, but CTA will demonstrate early sinus opacification (fig 4) and pronounced engorgement of its draining veins. The coronal and axial planes are most useful to show masses with MR, with the individual nerves running through the cavernous sinuses visible as tiny hypointense linear structures after contrast enhancement. Disruption of this pattern with displacement of the carotid artery or either the medial or lateral wall of the sinus suggests a mass (fig 5). T1 weighted pre- and post-contrast sections are the most useful and can be subtracted to visualise the enhancing portion more clearly, especially when the lesion is small. Lesions may extend laterally from the pituitary fossa or originate from the sphenoid bone, compressing the sinus medially. Arterial phase of a CTA showing opacification of both cavernous sinuses associated with engorgement of the orbit producing proptosis. 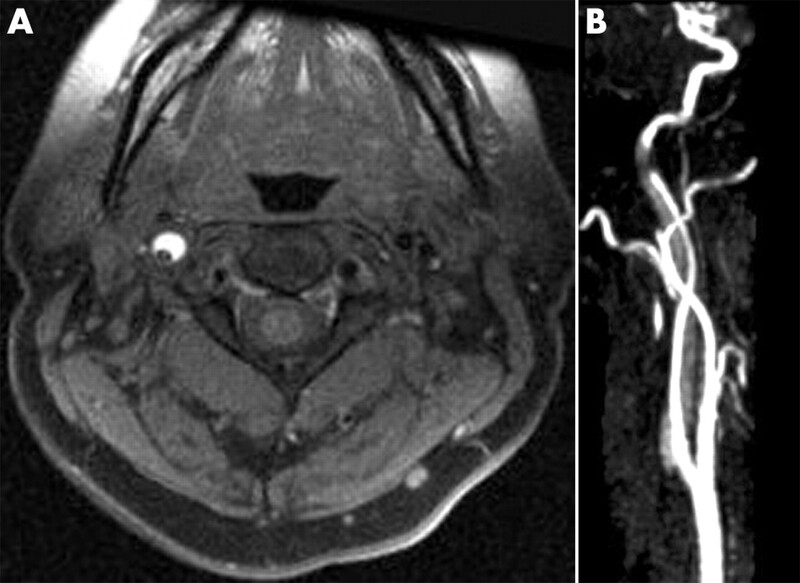 An indirect fistula between a meningeal branch of the carotid and the cavernous sinus was confirmed on digital subtraction angiography (DSA). Magnetic resonance (MR) T1 weighted post-contrast coronal section showing a pituitary macroadenoma that has grown down and laterally to encase the right carotid siphon and invade the right cavernous sinus compressing its contents. It also extends into the right foramen ovale. Although all the modalities mentioned can demonstrate cavernous sinus thrombosis it is most easily shown by CTA when the acquisition is slightly delayed to show the lack of expected normal venous opacity (fig 6). Associated dilated or thrombosed superior ophthalmic veins can be shown on axial sections while the other sinuses and internal cerebral veins must be searched for filling defects representing further thrombosis. 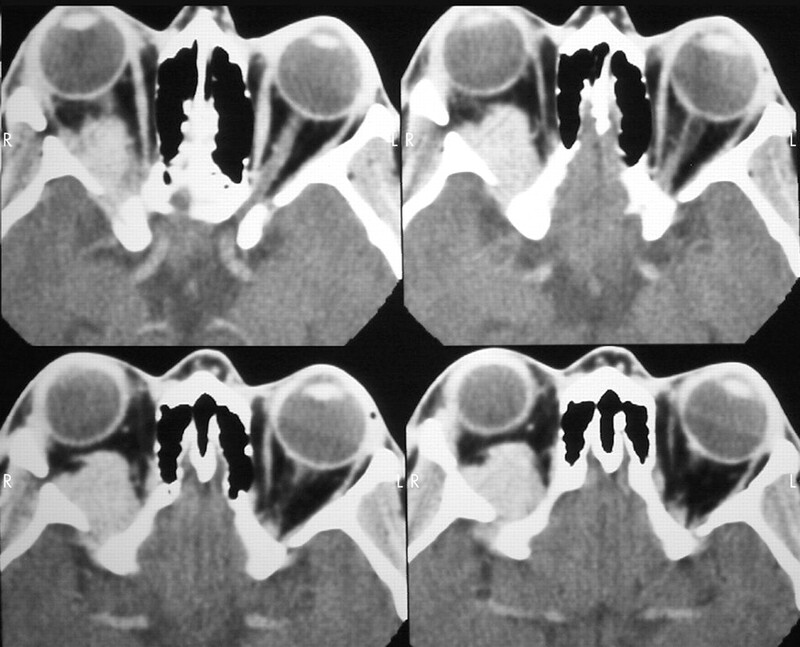 Infection in the sphenoid sinus which may have caused the thrombosis can be seen as soft tissue replacing the normal air in the sinus (fig 6). This is hyperintense on T2 weighted and moderately hypointense on T1 weighted MR sections. 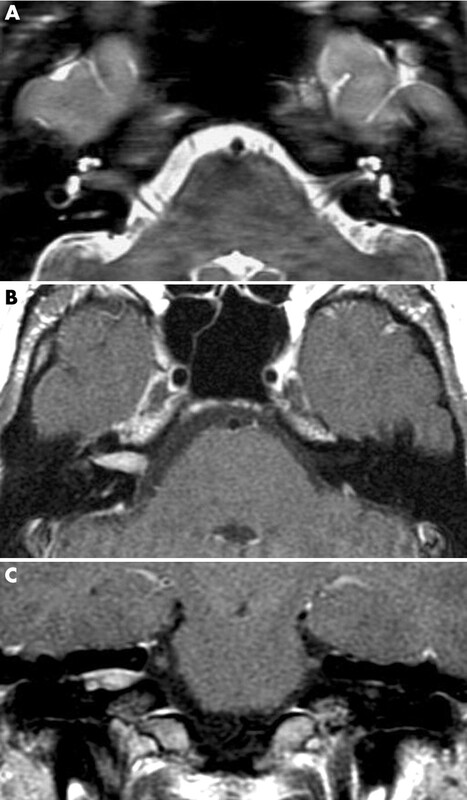 The inflammatory granulomatous masses cannot be differentiated from tumours other than being less well bounded and show more diffuse enhancement on MR or CT.
Venous phase of a CTA in a 19 year old with a history of sinusitis and progressively worsening headache and a fever. No contrast has reached the cavernous sinuses bilaterally yet the internal carotid arteries are well delineated. The filling defects in the cavernous sinuses represent thrombosis. Adjacent right sided posterior ethmoid air cells are fluid filled, consistent with sinusitis and the cause of the thrombosis. These are essentially similar as for orbital fissure/orbital apex syndromes, the primary purpose being to distinguish central nervous system confined from systemic disease as well as identifying risk factors (diabetes, HIV status), source of infection (paranasal sinuses/chest), or primary neoplastic disease. The range of investigation is wide and dictated by the neuroradiological findings, as is similarly the need for CSF examination or tissue biopsy. occasional 5th and 6th cranial nerve involvement. Cerebellopontine angle (CPA) lesions are invariably neoplasms, most of which are benign. They account for 5–10% of all intracranial tumours. The majority (85%) are vestibular schwannomas (acoustic neuromas). These tumours usually expand centrally from the internal auditory canal, occasionally intracanilicular, spreading into and eventually filling the CPA. Other rarer tumours include meningiomas, epidermoids (primary cholesteatoma), 7th and lower cranial nerve schwannomas, and arachnoid cysts. Malignant disease (in particular metastases) is surprisingly rare (2%). Progressive sensorineural hearing loss is the most common presenting symptom often associated with high pitched tinnitus. Tinnitus often subsides as hearing loss progresses to complete deafness. Sometimes hearing loss may be misleadingly acute in onset due to haemorrhage into tumour or compression of the internal auditory artery with end organ infarction. Vertigo in isolation is an unlikely presenting symptom, though frequently leads to requests for imaging of the CPA. This is the main area where MR examinations are superior to CT because of unavoidable bone hardening artefacts on CT. High definition heavily T2 weighted thin three dimensional 1 mm thick resections (CISS type) are used for screening the CSF spaces of the posterior fossa and are particularly useful in the CPAs, showing each of the cranial nerves and the vessels as filling defects in the CSF (fig 7). With careful analysis any abnormal masses can be delineated. Post-contrast T1 weighted thin (2–3 mm) axial and coronal sections are easier to interpret and are most useful for positively defining vestibular schwannomas, meningiomas, and neuromas—all showing enhancement (fig 8). Their typical patterns and associated involvement of the acoustic canal and petrous bone allow a definitive diagnosis in most patients. CT is useful to show calcification in meningiomas, while the exquisite bone detail from CT can be merged with the soft tissue from the MR to assist operative planning. Vascular imaging with DSA can define the supply to masses such as meningiomas and allow access to carry out preoperative embolisation, especially in the larger lesions. Non-enhancing lesions include arachnoid cysts (fig 9) and epidermoids. They can be differentiated on diffusion weighted MR with the epidermoid showing restriction of diffusion. MR thin (0.7 mm) CISS type sequences of the normal cerebello-pontine angles (A) axial and (B) coronal sections showing the cochlear nerve in the internal auditory canal leading to the fundus and the loop of the anterior inferior cerebellar artery on the right. MR (A) CISS type axial sequence, thin section (2 mm) T1 weighted, (B) axial, and (C) coronal sections showing an intracanalicular soft tissue displacing normal cerebrospinal fluid (CSF) from the canal on the CISS sequence and showing enhancement on the T1 weighted sections. MR (A) T2 weighted and (B) T1 weighted post-contrast axial sections show a lesion giving a similar signal to CSF, with a thin surrounding hypointense membrane and no enhancement after contrast. These are the appearances of an arachnoid cyst. Schwannoma tumours arise when there is a defect in a certain tumour suppressor gene. The cause of the genetic defect is not known. However, acoustic schwannoma is often linked with the genetic disorder neurofibromatosis type 2 (NF2), and genetic testing should be discussed when suspected. NF2 acoustic schwannomas tend to grow faster and more aggressively, infiltrating locally, are less uniform in shape, and more likely to recur. This makes management challenging. After diagnosis has been made additional investigations are required as part of the preoperative workup. Detailed neurotological evaluation is mandatory, usually combined with audiological testing, auditory evoked brainstem response (BAER), and occasionally vestibular testing (electronystagmography, ENG). The skull base has been likened to the “iron curtain” separating the specialties of neurosurgery, head and neck, and neuro-otological surgery by its solid, almost impassable state. The skull base may be affected by: primary tumours (for example, chordoma, sarcoma, eosinophilic granuloma, schwannoma, meningioma, paraganglioma); inflammatory processes (for example, cholesteatoma, Wegener’s granulomatosis, lethal midline granuloma); metastatic disease (for example, breast, lung, kidney, and prostate with mastoid and petrous apex showing a particular predilection); infection (for example, osteomyelitis, mucocele, fungal infection); trauma (for example, skull base fractures); vascular disorders (for example, carotid occlusion, venous sinus thrombosis); and developmental abnormalities (for example, Chiari malformations). The neurologist needs an awareness of the wide spectrum of diseases that affect this area and commonly present with cranial nerve palsies. A knowledge of the cranial foramina and contents is essential (table 1), as is an understanding of the relation of structures both immediately and above and below the skull base. The symptoms of lower cranial nerve disease, dysphagia, dysphonia, and dysarthria are frequently a reason for neurological consultation. Where combinations of cranial nerve symptoms and signs arise in isolation, skull base disorders should be suspected and investigated accordingly. The petrous apex syndrome (Gradenigo’s syndrome) is typically associated with suppurative otitis media affecting the petrous apex of the temporal bone. There is pain in the 5th nerve distribution combined with 6th cranial nerve palsy. Spread of infection though the skull base can result in a jugular foramen syndrome or prevertebral/parapharyngeal abscess. The jugular foramen syndrome (Vernet’s syndrome) results in paralysis of the 9th, 10th, and 11th cranial nerves. Characteristically there is involvement of the superior constriction of the pharynx with difficulty in swallowing solids; paralysis of the soft palate with anaesthesia of the pharynx; loss of taste in the posterior third of the tongue; paralysis of the vocal cords with laryngeal anaesthesia; and paralysis of the sternocleidomastoid and trapezius muscles. The most common causes of this syndrome are metastatic tumour, schwannoma, meningioma, and glomus tumour (see below). The retropharyngeal space syndrome (Villaret’s syndrome) causes paralysis of the 9th, 10th, 11th, and 12th cranial nerves and occasionally the 7th, due to extension into the retro-parotid space. There is weakness of the superior constriction of the pharynx with dysphagia for solids; paralysis of soft palate with associated anaesthesia of this and of the pharynx; loss of taste in the posterior third of the tongue; paralysis of the vocal cord with laryngeal anaesthesia; paralysis of the sternocleidomastoid and trapezius; and paralysis of the cervical sympathetic nerves resulting in Horner’s syndrome (meiosis, anhidrosis and ptosis). Common causes include mass lesions, usually metastatic. The intercondylar space syndrome (Collet-Sicard syndrome), with involvement of the 9th, 10th, 11th, and 12th cranial nerves, produces paralysis of the vocal cords, palate, trapezius muscle, and sternocleidomastoid muscle; it also causes secondary loss of the sense of taste in the back of the tongue, and anaesthesia of the larynx, pharynx, and soft palate. This is distinguished from Villaret’s syndrome by the absence of sympathetic involvement. Again metastatic disease is the most frequently encountered cause. The internal carotid artery with its plexus of veins and sympathetic fibres runs through the petrous portion of the temporal bone, entering inferiorly just anterior to the jugular foramen, then passing anteromedially for some 2 cm and exiting into the cranial cavity. Occlusion of the carotid artery at this level produces a variable degree of infarction within its territory associated with an ipsilateral Horner’s syndrome. The blood supply to the lower cranial nerves may be derived from the ascending pharyngeal branch of the carotid artery arising at its bifurcation. This is the explanation for the lower cranial nerve dysfunction curiously seen with carotid artery dissection. Causes include infiltrating tumour, dissection and aneurysms of the petrous portion of the carotid artery. The hypoglossal foramen is located immediately inferior-medial to the jugular foramen and rarely, at this site, is solely involved. An isolated 12th nerve palsy is more likely to be caused by peripheral neck lesions such as penetrating trauma, in particular to the carotid sheath, or local infections. Neurological findings here are complex and occasionally misinterpreted as suggesting a disseminated disorder. Intra-axial posterior fossa lesions near the foramen magnum may present with lower cranial nerve dysfunction, long tract signs only becoming obvious with mass expansion within the brain stem or cerebellum. The complex array of cranial nerve, motor, and sensory signs are often accompanied by sub-occipital headache and neck stiffness. Obstruction to CSF drainage can result in papilloedema. The eye movement disorder of downbeat nystagmus is highly site specific. Cough headache and transient cough leg weakness suggest a “tight” or “crowded” foramen. The nature of the medullary pyramidal decussation (arms before legs) can result in a crural or crossed paresis—hemiplegia cruciata—affecting the ipsilateral arm and contralateral leg. Primary posterior fossa tumours, meningioma, neurofibromatosis, and Chiari malformation are among the many causes. Chiari malformation (type 1) is more often an incidental finding than a symptomatic one. There are some disorders of the temporal bone and skull base which, while rare, attract curiosity and possibly because of this are often mentioned in neurological differential diagnosis. Cholesteatomas or epidermoids are soft tissue masses that result from the accumulation of keratin debris within an envelope of squamous epithelium. These are not neoplasm in that they do not manifest cellular growth. They arise in the middle ear, mastoid bone, or petrous apex and can be subdivided into: congenital cholesteatomas arising as a result of squamous epithelium trapped within the temporal bone during embryogenesis; primary cholesteatomas caused by tympanic membrane retraction; and secondary cholesteatomas resulting from injury to the tympanic membrane such as a perforation from acute otitis media or trauma. The diagnostic symptom is painless unremitting or recurrent otorrhoea. These lesions cause local bone destruction and recurrent infections. When cholesteatomas become infected this is difficult to eradicate as the mass is avascular and systemic antibiotics cannot penetrate. Hearing loss is also a common symptom, as is the finding of local bony erosion. These lesions, once recognised, should be excised. Paragangliomas are benign, slow growing head and neck tumours thought to arise from widely distributed paraganglionic tissue originating from the neural crest cells. These tumours show a close relation with the parasympathetic nervous system, arising from neural and vascular chemoreceptor organs distributed in the aorta, jugular bulb carotid body, ganglion nodosum of the 10th cranial nerve, and temporal bones. They arise spontaneously, are normally solitary, and rarely familial. Malignant characteristic and even lymphatic metastatic spread have been described. The predominant cells contain neurosecretory granules, though catecholamine excretion is rare and usually confined to tumours of the jugular bulb (glomus jugulare). Paragangliomas are the most frequent true neoplasm of the middle ear and temporal bone and the most common lesion of the jugular foramen. Glomus jugulare tumours compress vascular structures, eroding the jugular fossa. Erosion of the jugular foramen is associated with Vernet’s or Villaret’s syndrome with early extension to the hypoglossal canal. Glomus tympanicum tumours originate near the cochlea, filling the middle ear and displacing laterally the tympanic membrane though rarely perforating through it. Early symptoms are pulsating tinnitus with conductive deafness. Otoscopic examination demonstrates a purple pulsatile retro-tympanic mass. Pulsation can be reduced by ipsilateral carotid compression—Aquino’s sign. These tumours are managed by resection often preceded by embolisation. Langerhans cell histiocytoses (histiocytosis X) are a group of disorders characterised by eosinophilic and histiocytic proliferation. These neoplasms are subdivided into the infantile form (Letterer-Siwe disease), eosinophilic granuloma, and Hand-Schuller-Christian disease. Skull bone erosion is common, especially affecting frontal and temporal bones. Diagnosis is confirmed by open biopsy showing eosinophil and histiocyte proliferation. Hand-Schuller-Christian disease may present with otorrhoea and deafness. These disorders can affect the skin and abdominal viscera. At the skull base CTA and MRA are complimentary, with DSA also used for assessing the detailed vasculature of mass lesions and giving access for therapeutic procedures. CT is ideal for accessing the bony detail including erosion and deformity, particularly around the jugular foramen and petrous bone (fig 10). Lesions of the skull base also involve the extracranial and intracranial soft tissues and only MR will provide the soft tissue contrast and spatial resolution to show these structures. T1 weighted sagittal sections on routine brain scans are particularly useful to assess the midline structure of the skull base where special attention should be paid to the marrow texture of the clivus, the sphenoid sinus, the posterior nasopharynx, and the pituitary fossa. Congenital lesions such as Chiari malformations are best shown on T1 or T2 weighted MR sagittal sections and show tonsillar herniation through the foramen magnum > 3–5 mm (fig 11). A search for any associated syringohydromyelia should be made in the cervical and thoracic cord with T1 and T2 weighted sagittal MR sections. CT with bone windows shows the typical “ground glass” texture and enlargement of the abnormal bone formation in fibrous dysplasia involving the skull base and the neurovascular foramina. 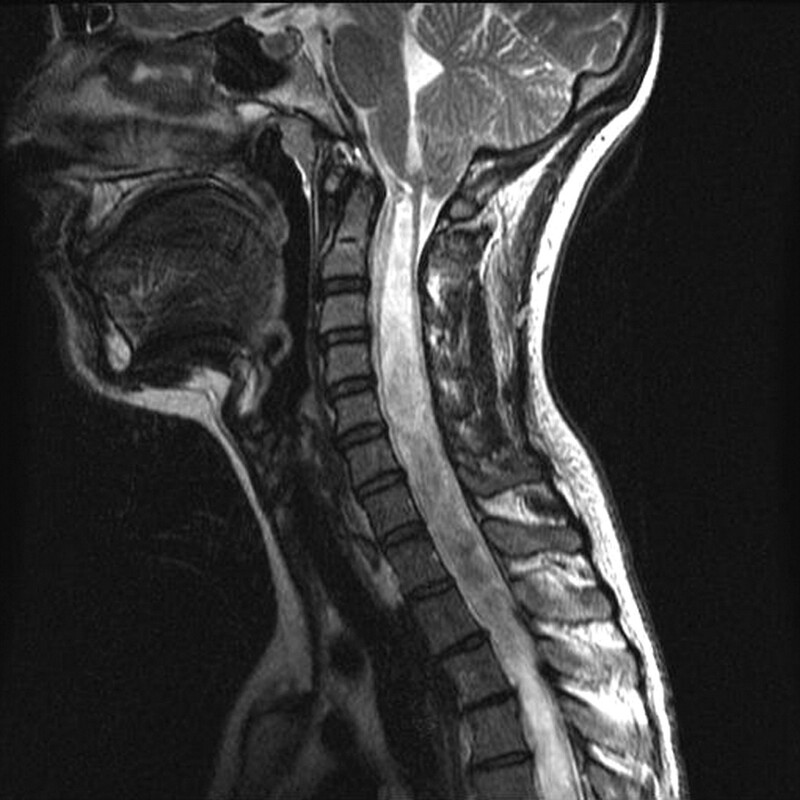 T2 weighted sagittal MR shows a Chiari I malformation with tonsillar ectopia (9 mm) at the cranio–cervical junction, resulting in disruption of normal pulsatile flow of CSF and the development of an extensive syrinx. The posterior fossa and skull base must be included in all routine studies so as not to miss a clinically unexpected central cause of the symptoms and signs. Meningiomas at the skull base show enhancement on T1 weighted axial (fig 12) and sagittal sections characterised by a broad dural margin and often dural “tail” of enhancement. They are frequently isointense or hypointense to grey matter on T2 weighted sections and so can be easily missed on routine non-contrast brain scanning. T1 weighted post-contrast MR shows an extra-axial enhancing mass with a broad dural base and a short “dural tail” compressing the medulla and inferior cerebellum. These are the typical appearances of a meningioma. A crucial role of imaging the skull base is to access tumour extension from or into the neck, particularly with bone erosion and through the neuroforamina along nerves and vessels. 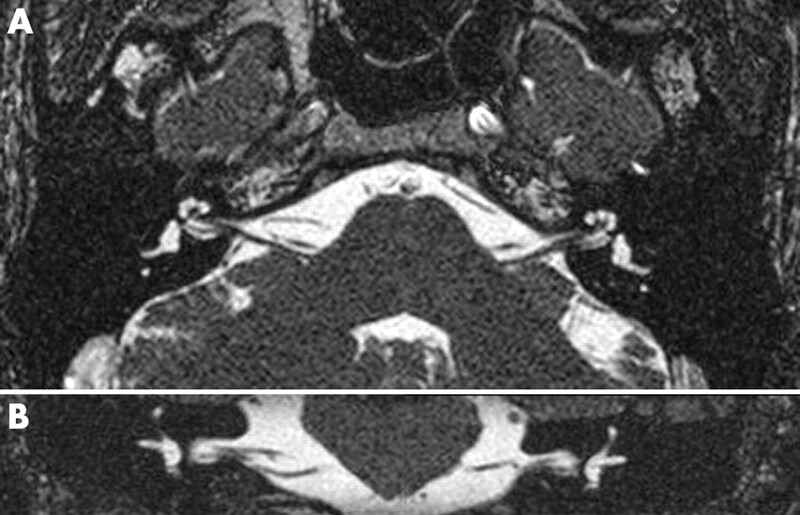 Pre- and post-contrast axial and coronal MR sections are used. Subtraction images can be used to highlight enhancing structures and for follow-up assessments. STIR coronal sections are particularly useful for “screening” the region (fig 13). A contrast bolus is useful with both CT (fig 14) and MR to show the relation between masses and adjacent displaced arteries and veins. MR coronal fat nulled STIR (short tau inversion recovery) sequence highlighting multiple lesions (neurofibromas) in the skull base and neck in a patient with neurofibromatosis. 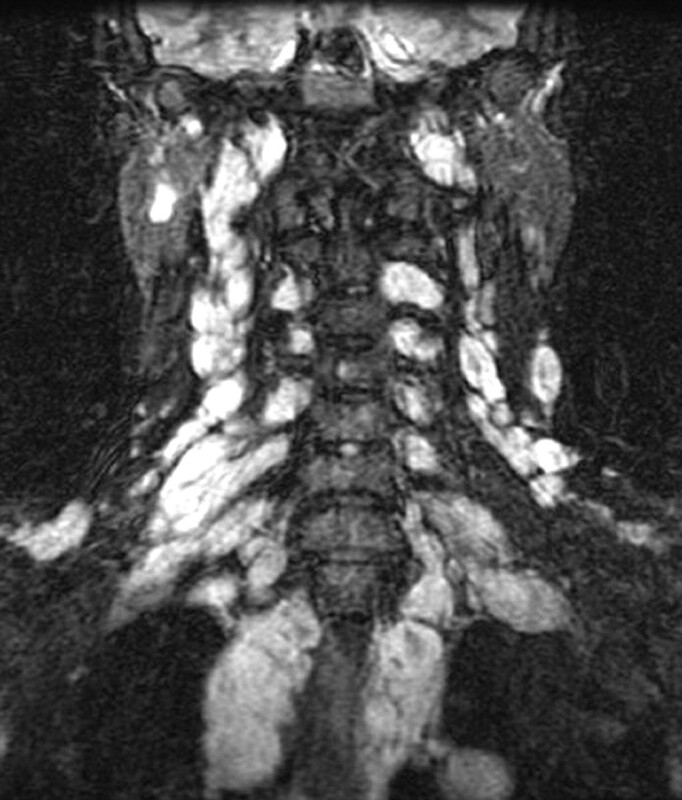 Helical CT with coronal reconstruction of the skull base and neck after a bolus of contrast, showing a large paraganglioma displacing the internal carotid artery as it enters the foramen. 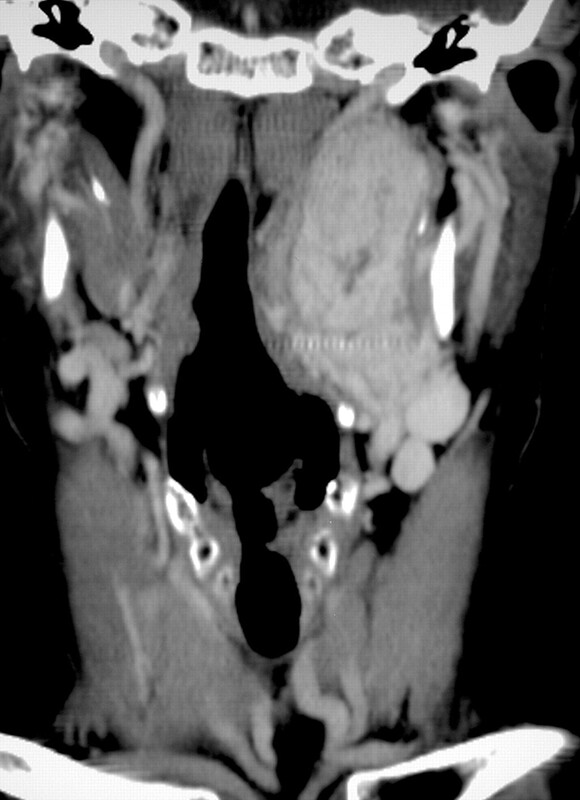 The results of mass effect in relation to the carotid canal can be seen with CT. MR can show the lesion itself. When there is carotid dissection the thrombosis in the false lumen can be characteristically seen as methaemoglobin on T1 weighted axial sections with frequency selective fat saturation as a hyperintense crescent shaped signal (fig 15). MRA will also show the flow pattern so that DSA is now rarely required. MR examination of a patient suspected of having had a dissection of the right internal carotid artery. (A) T1 weighted frequency selective fat saturated axial section showing the flow void in the true lumen and the subacute thrombus in the false lumen confirming the dissection. (B) Time of flight MRA of the runoff from the right common carotid artery showing the tapering irregular hyperintense lumen and the “ghost” of the thrombus in the false lumen around it. A wide differential diagnosis must again be considered. Once more radiological differential diagnosis helps formulate the laboratory approach to investigation. Trauma requires targeted evaluation of other bony structures and solid organs. Mass lesions should direct the search for primary neoplasia—chest x ray, chest, abdominal and pelvic CT/ultrasound, tumour markers, and positron emission tomography (PET). Infections and inflammatory processes require the usual investigative enquiries into infective agent, primary source, and immunological susceptibility. Finally vascular disorders mandate vascular imaging (CT angiography/venography, MR angiography/venography) with coagulation and autoantibody (ANA/ENA/ANCA) and other risk factor studies. Bhatia K, Jones NS. 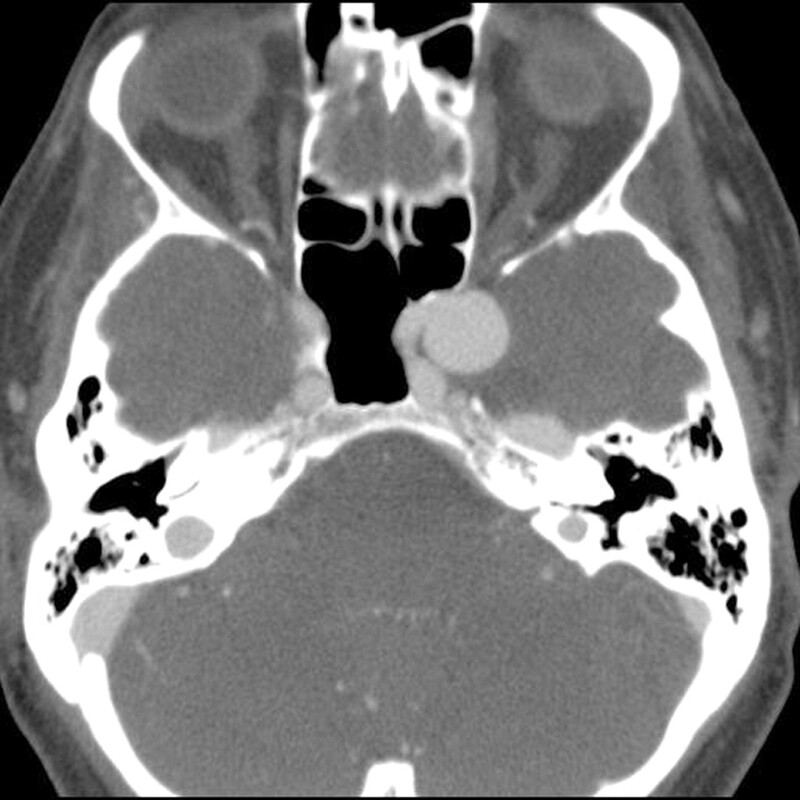 Septic cavernous sinus thrombosis secondary to sinusitis: are anticoagulants indicated? J Laryngol Otol2002;116:667–76. Brazis PW, Masdeu JC, Biller J. Localization in clinical neurology. 4th ed. Lippincott, Williams & Wilkins 2001. Ebright JR, Pace MT, Niazi AF. Septic thrombosis of the cavernous sinuses. Arch Intern Med2001;161:2671–6. Ho SY, Kveton JF. Acoustic neuroma. Assessment and management. Otolaryngol Clin N Am2002;35:393–404. Kline LB, Hoyt WF. Nosological entities? The Tolosa-Hunt syndrome. J Neurol Neurosurg Psychiatry2001;71:577–82. Pellitteri PK, Rinaldo A, Myssiorek D, et al. Paragangliomas of the head and neck. Oral Oncology 2004;40:563–75. Phillips PH. Carotid-cavernous fistulas. Neurosurg Clin N Am1999;10:653–65. Roberti F, Sekhar LN, Kalavakonda C, et al. Posterior fossa meningiomas: surgical experience in 161 cases. Surgical Neurology 2001;56:8–20. Rupa V, Job A, George M, et al. Cost-effective initial screening for vestibular schwannoma: auditory brainstem response or magnetic resonance imaging? Otolaryngol Head Neck Surg 2003;128:823–8.